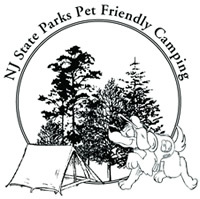 The New Jersey State Park Service is once again welcoming pets and their owners to select campgrounds within the NJ State parks/forests. There will be an additional charge of $5.00 per night to utilize a pet friendly campsite. Responsible ownership is the key! 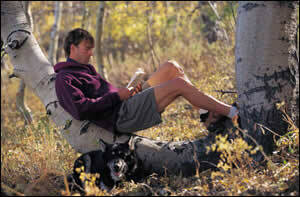 Pet friendly camping is limited to domestic dogs and cats, with a maximum of two pets per camping permit. Permittees need to fill out a Pet Registration and Certification form during the check-in process which will be retained in the area files. Dogs and cats must have current rabies vaccinations. Written proof of the pet’s current rabies/distemper vaccine and license (if a license is required by the resident’s State) must be provided during the check-in process. Caged pets (birds, reptiles or amphibians) are permitted within the confines of a camping recreational vehicle (trailer or motor home). Park or forest staff will advise patrons what sites may have pets. Your pet’s behavior is your responsibility. Pets must be kept on a leash six (6) feet or less in length and under physical control of its handler at all times. 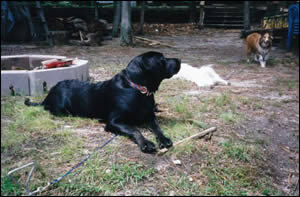 Pets shall not be left unattended on the campsite, except when the permittee is using a restroom or visiting a park building for a brief period of time. When doing so, the pet must be kept in a camping unit or vehicle, weather conditions permitting. The permittee is responsible for their pet’s behavior. Barking or other excessive pet noise that is unduly annoying to others must be controlled. The designated campground quiet hours between 10 p.m. and 6 a.m. is expected to be observed by all visitors. Any injuries must be immediately reported to the State Park Police or to the 24-hour DEP HOTLINE at (877) 927-6337. Local animal control officers will be contacted to address pets suspected of being abandoned or neglected. The permittee is responsible for any costs associated with animal control services. The permittee is responsible for immediate and sanitary disposal of the pet’s waste. Pet food must not remain outside of a camping unit or vehicle because it will attract wildlife. Pet washing at potable water sources or natural waterways (i.e. lakes, rivers, streams) is prohibited. Violators of these guidelines are subject to permit revocation and eviction from the premises.